India’s Sadhus are Hindu holy men who give up the material life to seek enlightenment. There are different sects of Sadhus and this man is part of the Shaivas, those who follow Shiva the god of destruction and creation. Carefully painted on his head in red vermillion is an Om sign. The yellow lines, which were painted with turmeric, are worn by followers of Shiva. His necklace is also an Om sign. 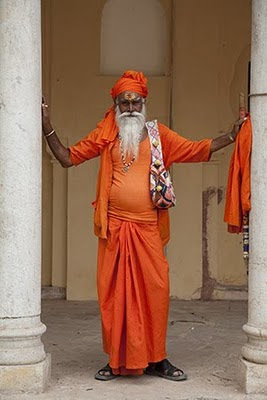 The saffron color of his clothes represents renunciation or the fourth phase of Hindu life after studying, becoming a parent and a religious pilgrim. Saffron represents fire, which burns or eliminates worldly desires. 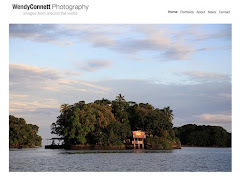 Great post that colour is my fav too !. 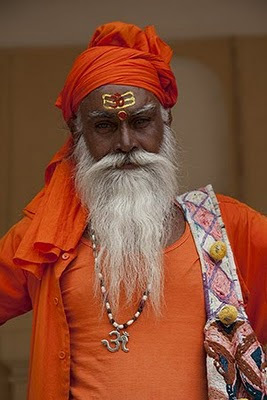 I've seen many sadhu pohtos and these are really compelling. Shiva followers are always so dramatic! Beauty,Flygirl and Jen, Thank you. Lakshmi, There are indeed more fakes than the real thing.